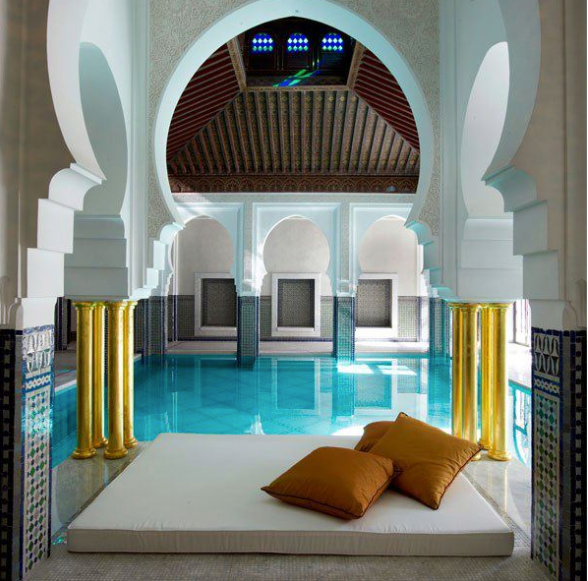 Moroccan style is a new trend in decoration which takes its roots from Moorish architecture, it has been made popular by the vogue of Riads renovation in Marrakech. Its becoming popular in some circles in UK and the USA. Riad Laksiba notably formed part of a reality TV program following a family buying and restoring an ancient Riad in the Medina of Marrakech. It was aired on House Hunters International to an estimated global audience of 97 millions on September 21st 2010. Due to the popularity of this trend the TV show is regularly repeated. Moroccan architecture is beautiful, ranging from royal arches to modern buildings lit up with neon lights at night.